"Take it to the farmer". Those were the last words of Dr. Norman Borlaug, as remembered by his granddaughter Julie Borlaug in her opening speech at the Africa Green Revolution Forum in Nairobi. The man whose improved wheat varieties sparked the Green Revolution in Asia during the 1960s had dreams to take new and improved agricultural technologies to Africa to spark a similar revolution here, but he died with "unfinished business". That challenge now lies with us. I believe that if Africa can have a Green Revolution, central to it will be a data revolution. That's down to the fact that we live in such a diverse continent, with many different environments and cultures. It's something to embrace and celebrate. But it also means that blanket solutions to agricultural challenges - like single new crop varieties - won't work here. There is too much nuance. There is too much complexity. Instead, African agriculture needs site-specific solutions. And key to that is the collection, sharing and analysis of farm data from all over the continent. We need African farmers to monitor their farms like never before - recording rainfall, fertiliser use, the crop varieties they sow and the yields they produce, and sharing their results with scientists. We also need research organisations, universities and governments to share the data they have generated over the years, with the global scientific community. By making data open access, we could trigger a bonanza for farmers. The CGIAR Big Data Platform will play an important role in this. When it launches in January 2017, it will be the largest convenor of big data experts in agriculture in the world. It will also collate and crunch data from organisations globally. Then thousands of computer modellers, GIS experts, and statisticians from the public and private sectors will mine it for patterns, trends and anomalies. The Platform will be the place where data becomes intelligence, giving us unprecedented insights for improving agriculture. These will be shared directly with policymakers and governments so that intelligence becomes action on the ground. It will help farmers make better decisions about what to plant, when to plant and how to manage their crops in the best possible way. They will help make agriculture much smarter and much more precise. 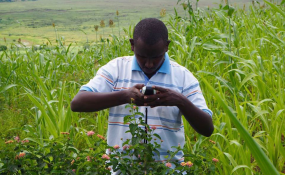 And smart, precision agriculture is much more resilient to unpredictable weather, to pests and disease outbreaks and other challenges that affect African farmers every day. It will help take some of the huge risks out of farming, boosting food production, and helping protect soils and ecosystems. It will also ensure that agriculture is more responsive to new technologies, new practices and emerging market opportunities. That will not only improve productivity and boost yields, it will enable farmers to grow and feed their own families more nutritious food. Of course, when you improve smallholder farming in Africa, you also improve the lives of women. We need no reminding that they are the ones who put the food our tables here. We've already seen how collecting and sharing high quality data can help us achieve incredible, things, very quickly. In Colombia recently, rice producers saved millions of dollars by delaying planting until a dry spell had passed. This was the result of CIAT and the Colombian government working together with shared information and shared goals. I want to see these kinds of innovations and these kinds of impacts here in Africa. We accept there will be challenges. But these shouldn't stop us. When Norman Borlaug sent his improved wheat seeds to India, it wasn't a smooth ride. They were held up at customs, denied permits and the first batch was entirely destroyed. But that didn't stop him eventually getting them to farmers. We should draw inspiration from this. It will require hard work, significant funding and global cooperation. But I firmly believe big data has the power to transform and revolutionise African agriculture. We need to seize the moment, and take that message to the farmer. The CGIAR Big Data Platform is jointly led by the International Center for Tropical Agriculture (CIAT) and the International Food Policy Research Institute (IFPRI). For more information click here. Copyright © 2016 allAfrica.com. All rights reserved. Distributed by AllAfrica Global Media (allAfrica.com). To contact the copyright holder directly for corrections — or for permission to republish or make other authorized use of this material, click here.